Watch the madness that happened when Rob met Kanan Gill, one of the top stand up comedians in the country and really famous for his pretentious movie reviews. 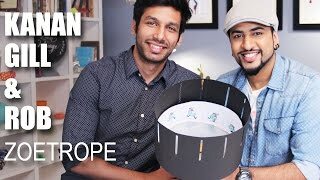 Learn how to make a Zoetrope and relive those days when real films were used in the world of animation and movie making. For more Artrageous stuff to - ... Like on G ... Follow on Twitter instagram For Bookings contact Nihaal Poonja 91-9920585595 nihaal.poonjasonymusic.com Sony Music Kids Initiative. C P 2015 Sony Music Entertainment India Pvt.Ltd.